The Potteries Museum & Art Gallery, Hanley, Stoke-on-Trent, Staffs. OS Grid Reference: SJ 88172 47323. 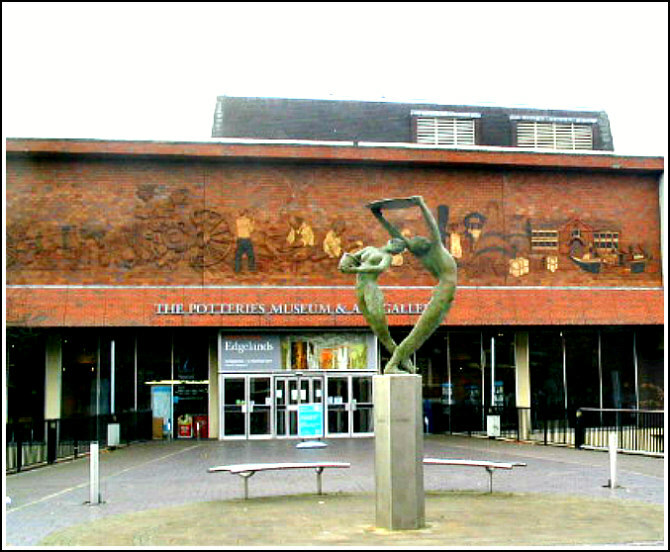 The Potteries Museum And Art Gallery is a Local Authority Museum that is situated on Bethesda Street, Hanley, Stoke-on-Trent, Staffordshire. Inside the museum there are displays and collections of artefacts from prehistory including The Leekfrith Torcs, while from the Dark Ages: The Staffordshire Hoard; also Natural History, Geology and Landscape. From more recent times there are displays of local ceramics and decorative arts. But by far the most famous thing on display must be the World War II Spitfire. 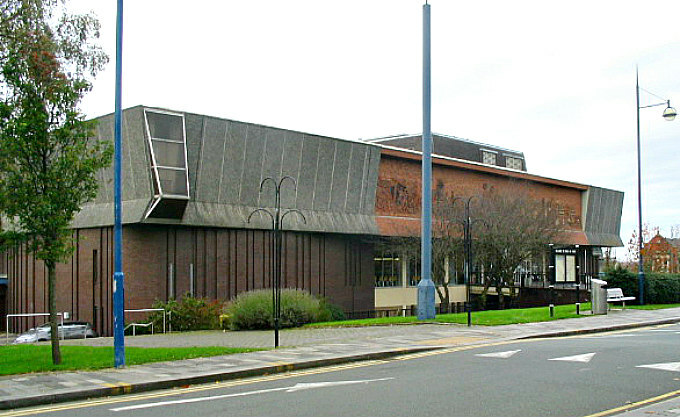 The museum and art gallery stands just 160 metres to the northwest of Hanley Bus Station and is close to the City Central Library and Police Station; the A5006 (Broad Street) runs a little to the west of the museum. There is free admission. Times of opening are from Monday to Saturday 10am to 5pm and on Sundays from 11am to 4pm. There is also an excellent café and shop. The Potteries Museum & Art Gallery, Hanley, Stoke-on-Trent. The Potteries Museum at Hanley in North Staffordshire houses what are called ‘Designated Collections’. These range from ancient historical artefacts to a much more recent World War II Supermarine Spitfire, designed by Reginald J. Mitchell (1895-1937) from Talke, Stoke-on-Trent. As well as artefacts from the prehistory of Staffordshire, such as the 2,400-year-old ‘Leekfrith Torcs’ – the earliest known Iron-Age gold artefacts, there are more than 80 pieces from the famous ‘Staffordshire Hoard’ which found in 2009 and date back to the Anglo-Saxon Age. Also Local History, Geology and Landscapes of north Staffordshire, especially the Stoke-on-Trent area, with its rich history of industrial manufacturing sites ranging from coal mines to the famous pot-banks and canals that are so well-known to the area. Apparently there are over 5,000 pieces of ceramic-ware much of which comes from the Potteries including Wedgewood and Minton. And from the 15th century to more recent times there is a fine collection of costumery and textiles. And a fine arts collection as well as Jade and Ivory pieces. Most pleasing must be the reconstructed, life-like street with shops and public house! A recent attraction for youngsters is the Secret (Sensory) Garden. The Art Gallery has paintings by the Classical artists including Picasso and Degas. The Potteries Museum has had a long association with two or three other local museums that also have collections and displays of pottery and industrial heritage. Categories: Museum | Tags: The Potteries Museum And Art Gallery at Hanley in Stoke-on-Trent | Permalink.